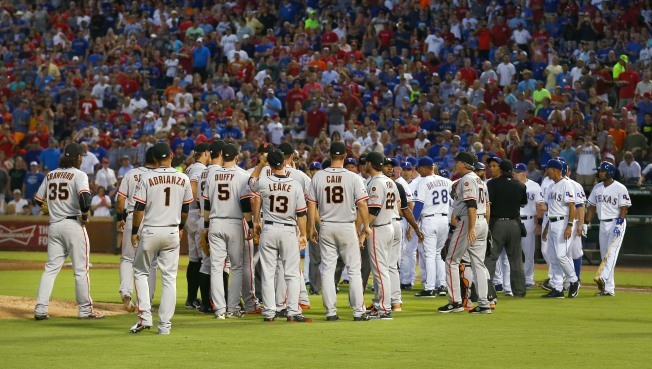 There was every reason to believe the Texas Rangers' current home stand wouldn't end well for the good guys. The Rangers entered the 10-game stretch with the worst home record in baseball, despite being baseball's best road team, and were set to play three teams — Yankees, Giants, Astros — who were, at the time in first place in their division (Yankees and Astros) or comfortably in a Wild Card spot (Giants). Somehow, it hasn't been a disaster. The Rangers, with their 12-9 win over Houston to open a three-game set to close out the home stand, guaranteed themselves at least a .500 home stand with a chance to make it a winning one by winning their second straight series with a win either Tuesday or Wednesday. This new-found competence at home could come into play soon, as they hit the road Friday before returning home next weekend to face a fading Rays team and a horrible Mariners team. If the Rangers are going to make a run in August to make September interesting — with 12 more home games — they're going to have to be good at home. It was inexplicable how such a good road team could be so horrible at home, and it appears that fortune might finally be turning four months into the season. The Rangers sure hope so.